Prominent & Leading Manufacturer from Chennai, we offer demineralisation plants. We hold a great expertise in offering our clients with highly efficient range of Demineralisation Plants that can easily purify water by removing numerous impurities from it. 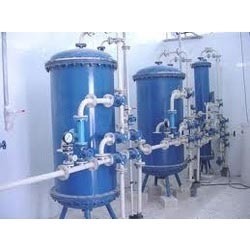 Our Demineralisation Plants are available in different sizes as per requirement of the customers, are equipped with advanced filters and perform faster removal of all kinds of water impurities, like bad taste, odors, colors, pesticides and harmful chemical contaminants as compared to regular water purifiers. These have single and multi port valves and are available in different capacities for the suitability of the clients. Looking for Demineralisation Plants ?